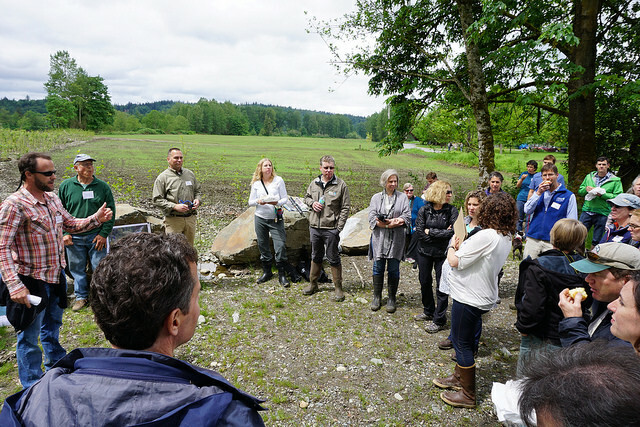 A multi-year effort to reconnect the Snoqualmie River to 50 acres of its historic floodplain near Fall City is finished, and the broad partnership that was assembled to complete the Upper Carlson restoration project celebrated with an event and tour at the site on May 14. 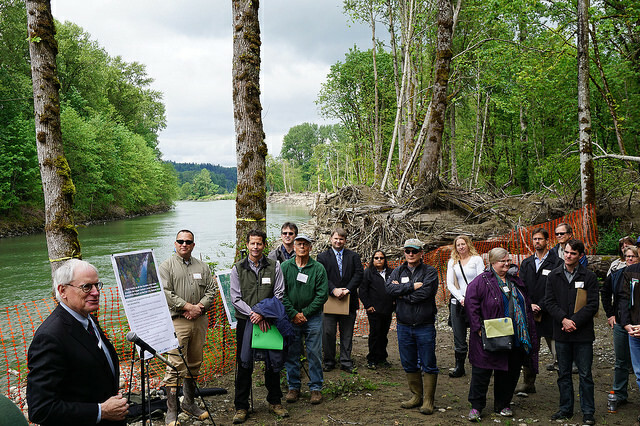 The work was done on King County’s Fall City Natural Area – a 50-acre forested floodplain that historically contained the Snoqualmie River’s main stem. The project included removing roughly 1,600 linear feet of aging levee that constrained the river to an unnaturally narrow channel. As natural processes are restored, gravel bars and log jams will form, providing additional salmon habitat. To maintain protection for nearby homes, roads and fertile farmland, project managers designed and installed log structures and a new 850-foot-long rock structure at the lower end of the site to provide additional protection where the river is most likely to migrate.